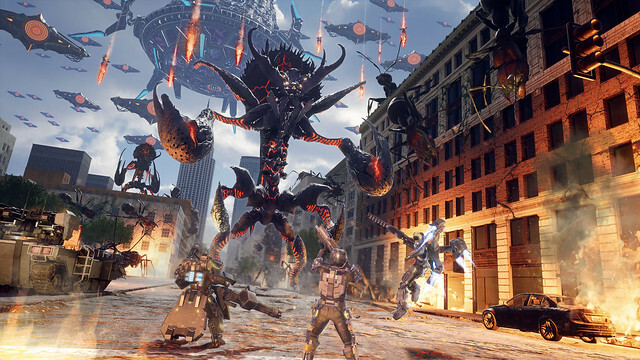 The long-awaited 2nd trailer of the another EDF series "EARTH DEFENSE FORCE:IRON RAIN". The main force of EDF is the mobile ground troops which are armed with powered exoskeleton for combat called the PA-Gear. Followed by "Trooper" and "Jet Lifter", the third mobile ground troop called the "Heavy Striker" has finally been exposed. Check out the the brave figure of "Heavy Striker" with advanced power and defense skills right here in this trailer. Also, many new enemies which the Aggressor has sent have also been revealed. Not only the gigantic spider type and scorpion type creatures, but human capture weapons will also be shown in the trailer. And what is the mysterious super huge monster which appeared at last? The intense battle scene of the Aggressor and EDF is unmissable. Lead the human beings to victory by using the special power "Over-Drive" which only the main character Closer can use.